Ford ST / RS Parts. Focus 1.0/1.6 Ecoboost. INDUCTION KITS / AIR FILTERS. HID Kits / Performance Bulbs. R8 / Devil Eye / DRL Headlight. Lowering Shock & Spring Kits. Wheel Nuts Bolts / Spigot Ring. If you do not see what you want please call as we are adding new items every day. Vauxhall Astra J Mk6 2009 on Hatchback Prosport Coilover Lowering Suspension Kit. &###xA0;BRAND NEW IN BOX. PROSPORT COILOVER SUSPENSION LOWERING KIT. Designed for the following vehicles. Vauxhall / Opel Astra'J' Mk6 2009 onwards hatchback. (Will NOT fit GTC&###xA0;models and/or with the Flexride / CDC suspension). With the following engine sizes. 1.4 / 1.4 Turbo / 1.6 / 1.6 Turbo&##xA0. 1.3CDTi / 1.7CDTi / 2.0CDTi. Maximum front axle weight 1220kg. Maximum rear axle weight 1020kg. Will NOT FIT 4 wheel drive models. Will not fit vehicles with CDC / Self levelling / FlexRide suspension. Will NOT fit GTC / VXR or OPC models. Prosport kits are designed to lower the vehicle the following. Each kit comes complete with the following. 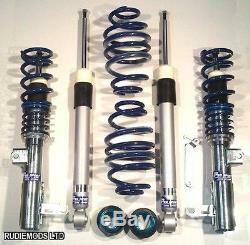 1x Pair Fully Adjustable height front coilover units. 1x Pair rear uprated shocks. 1x Pair uprated rear springs. 1x Pair rear ride height adjusters. Simple adjustment of the aluminium spring plate enables optimum road performance. Main and helper springs fully powder coated. All metal construction on main struts and fixing points. CARRIAGE IS ONLY FOR UK MAINLAND. SCOTTISH HIGHLANDS, NORTHERN IRELAND, JERSEY ETC (BT, IV, JE, HS, IM, AB 50+ etc, some PA etc) WILL COST AN EXTRA &###xA3;9.95. Sorry we do not accept American Express. We specifically disclaim any implied warranties of title, merchantability, fitness for a particular purpose and non-infringement. Customers should satisfy themselves that any item choice made is suitable for their intended purpose or use. We cannot be held responsible if the product is not suitable for use outside the UK. Therefore we reserve the right that if you have ordered the item incorrectly or no longer want the item we will at our discretion minus the following amounts (based on normal mainland UK addresses, non mainland and non UK maybe more) : Items sent by Post - &###xC2;&###xA3;2.95 Items sent by Recorded Post - &###xC2;&###xA3;4.95 Items sent by courier 1kg to 10kg - &###xC2;&###xA3;6.95 Items sent by courier OVER 10kg - &###xC2;&###xA3;9.95. This listing is currently undergoing maintenance, we apologise for any inconvenience caused. The item "Vauxhall Astra J Mk6 2009 on Hatchback Prosport Coilover Lowering Suspension Kit" is in sale since Friday, August 30, 2013. This item is in the category "Vehicle Parts & Accessories\Car Tuning & Styling\Performance Suspension\Performance Coilovers". The seller is "rudiemods" and is located in SOUTH WOODHAM FERRERS. This item can be shipped to United Kingdom, Ireland, Germany, France, Italy, Spain, Austria, Belgium, Bulgaria, Croatia, Czech republic, Denmark, Estonia, Finland, Hungary, Latvia, Lithuania, Luxembourg, Netherlands, Poland, Portugal, Slovakia, Slovenia, Sweden, Liechtenstein.